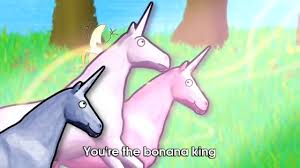 Difference Between BFA and Banana? So I keep seeing this "BFA Style" connector. What the heck does BFA stand for? and how is it different from a Banana connector? It seems like the BFA Style is this banana connector with the squiggly/cutout in it, and a regular banana connector has the spring mechanism all around, or in the 4 quadrants? Hehe, yeah, I read something about that. How does this prevent someone from sticking it in one of those sockets? Right Scott I'd like to know that as well. The marketing has always sold them as more contact surface. 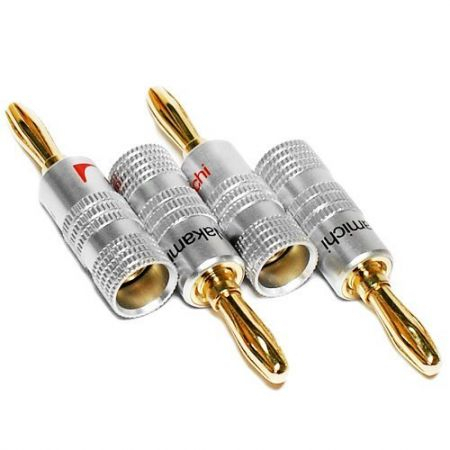 All I want are some banana plugs like I used to be able to get where you can use huge wire size, and crimp them and solder them easily, and don't cost a ridiculous amount of money. Last solder ones I got barely have any solder cup in them and a 14 gauge wire is about as big as it wants to take, so I've been using the Monoprice screw clamp ones and after tightening them up, using my big old foot long soldering iron to solder them. I have some old ones someplace, can't find them after I moved that took 8 gauge cables without problems, and a 60 watt iron was fine. 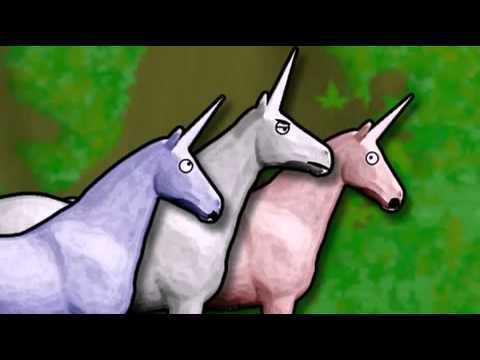 Cable atheist: They're just trying to get your money like a TV preacher! Vinyl system: I'm long done with the snap, crackle, and pop. Well, um, I guess I should have added "That don't cost an insane amount of money each" Almost $18 for four?? I don't think so, but thanks. When I can buy other ones that are usable, that are much nicer looking and appear to be a lot more solid, for much less, I'll pass. The description of them on the AQ page is pretty funny though, unless you believe in cable and connector magic. Oh my, I blasphemed..So sorry. I use the plugs in the upper part of DL’s post all throughout my system. W/a little patience, 8 gauge will fit. 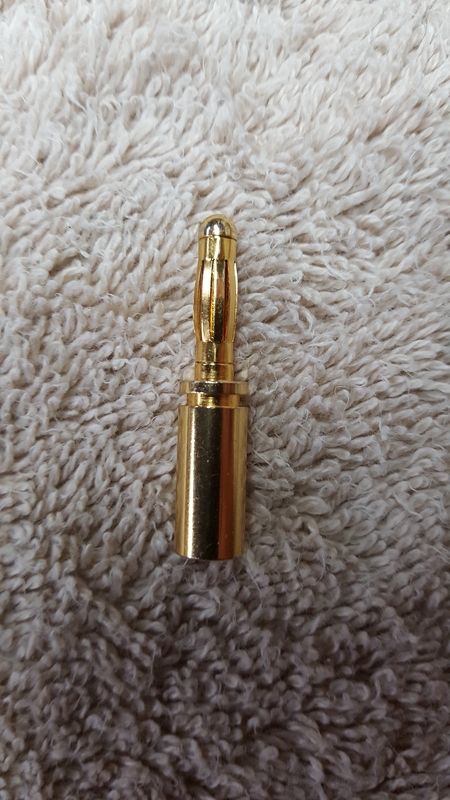 They don't take as large a wire as the ones I have in a box someplace, but they will take 12 gauge and that's big enough and they look deep enough to crimp without much chance of ruining them. The problem with the two piece screw ones is that if you crimp them, the screw on part won't fit, and if you don't, you need to use the giant soldering iron that is a pain to use, due to it taking forever to heat up, and it weighs a ton and keeps trying to slide out of my holder due to the stiff cord. I only normally use it for PL-259 radio antenna plugs. It works great for them. The new banana plugs will solder up fine with my much nicer to use 60W iron. Kingrat: I can’t argue w/your sentiment. The AQ & VOSO plugs - same material, same contact principle, but $4.50 versus $1.08 a piece. C’mo-o-on! I read the AQ product description. I don’t get your point. ...unless you believe in cable and connector magic. The new ones worked great, I made up 2 sets of cables last night one pair about 7 feet long each, and another pair about 20 feet long. The sleeve is more than long enough and it crimped easily and soldered fine with my 60 watt iron. 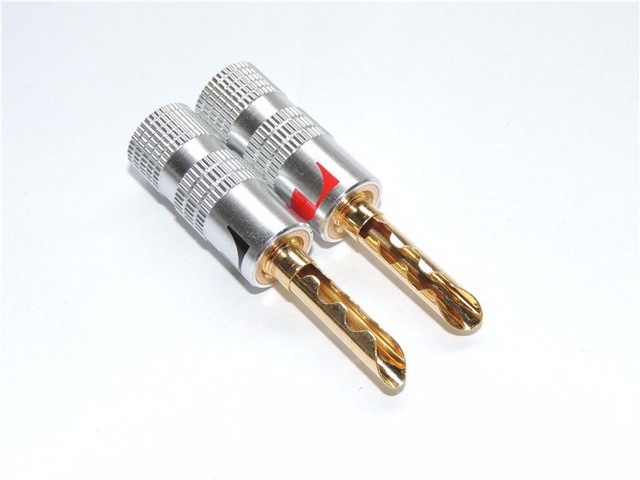 I'm buying some more of them, and putting them into my recently purchased plug/components holders so they wont go missing again. You don't get my point about the AQ (and other cables)? Did you read my sig? The mobile app doesn’t allow signatures through. I switched to full site - I get it. unless you believe in cable and connector magic. You'd be happier on one of the other forums that likes to dwell in mediocre. You find my lack of faith disturbing? You'll get more surface area contact with a BFA, has the whole barrel makes contact, not just the raised portion of a standard banana. Will it make any difference? I doubt it. I personally believe that cables do make a difference, and banana plugs probably do too, but I’m not gonna spend money on banana plugs because it is literally like a 2 centimeter connection point. It can make a difference, but I can’t imagine the money would be worth that little of one. Connectors are all about a good connection. And maintaining that connection under all circumstances. Like a chain, only as strong as the weakest link. Lots of info out there. Yeah there is a point of diminishing returns, IMO, but take a look. There's a price point for everybody! Another journey! FWIW. sorry, I forgot to add IMO in there. but yes, I do know what you mean. but I meant for my INCREDIBLY low price point, its not a viable upgrade. Don't misunderstand my comment. I am a believer in cable differences, but I don't see how the little bit of difference in contact area would affect the tonal characteristics of a cable. Now, If I were designing a cable form the ground up, I'd go with BFA's simply because more surface area contact certainly doesn't hurt anything--but I wouldn't stress about it on a cable that only came with standard bananas. I don't see how the little bit of difference in contact area would affect the tonal characteristics of a cable. Every little bit counts more than you think. On a power cord thread one reply read (paraphrased) “better bass due to .47 lower voltage drop.” Makes sense to me! Hence why I have 8 gauge wire soldered all the way to my woofer’s driver tabs. Same for 10 gauge to my LCR mids; surrounds to follow. Not all banana plugs are created equal. The ones dannylighting posted are poorly designed and constructed with minimal contact area. 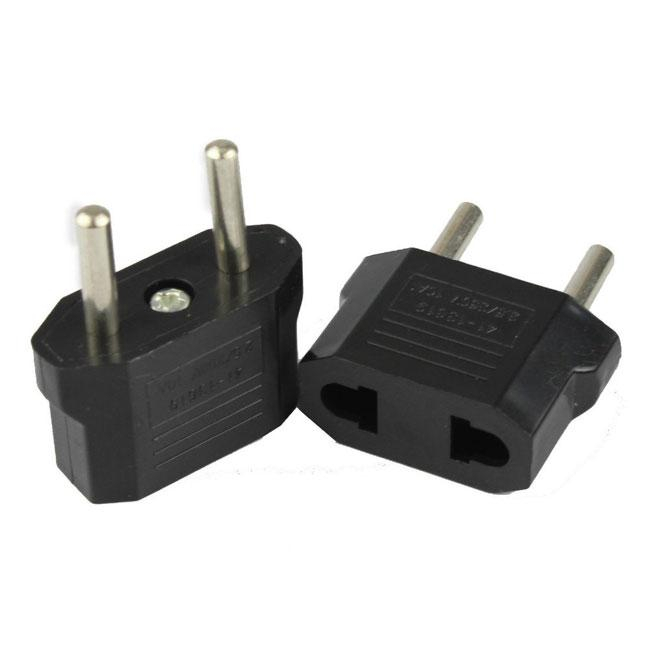 Compare them to high quality banana plugs such as the ones from MIT and the differences become obvious. The MIT's have 6 springs with a solid center post connected to a solid dome tip. The outer surface is in contact with the center post and when the springs are compressed they are too. Therefore, the MIT banana has considerably more mass, which means better conductivity. In addition, I measured the inside diameter of a Cardas binding post at .160 and the outside diameter of the MIT banana at .160 before and after the springs. With the springs compressed they also measure .160. Obviously, the banana is ever so slightly smaller than the post hole, but that's as accurate as I was able to measure. The difference is extremely small as evidenced by the super tight fit of the MIT banana plugs. Furthermore, the solid dome tip bottoms out in the binding post meaning it is in full contact. Compared to the BFA type plugs there is no doubt that a high quality banana not only has greater mass, it also has greater contact area. Note: for some damn reason (vanilla) all of a sudden today I am not able to post photos from my device on this site. I can everywhere else, so I know it's vanilla related. 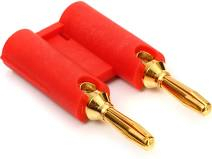 Maybe one of you guys can post a pic of the MIT banana plugs for me. I recently discovered my box of IMHO, failed, banana plugs. Most of them are no crimp/no solder types, but there are some that only take 14 gauge and up wire, or have only a tiny little wire socket that makes them very difficult to use I crimp and solder mine, and have a huge collection of short speaker cables going back about about 30 years when I converted my speakers over to bananas. I should probably sell the 40 or so Nakamichi (fakes?) I have just so someone else can maybe use them. The ones I use look pretty much identical to the big pic above. Crimp and solder, and never worry about them again.